The Crystal Clear River (SM) and Haiti Agriculture Innovation (SM) project present new agricultural discoveries for the island of Haiti. SPICY HOT PEPPER PLANTS INDICATE LOW SOIL CALCIUM IN HAITI. One of the problems of growing crops worldwide, is to have a quick, easy and inexpensive method to check and monitor soil nutrient levels. Craig Dremann, owner of the Redwood City Seed Company in Redwood City, California, and his Crystal Clear Rivers (SM) and Haiti Agriculture Innovations (SM) project in central Haiti, is using hot pepper plants to measure adequate calcium levels in soils in Haiti. The group of peppers called Habanero, Scotch Bonnets, Ghost pepper and Trinidad scorpions, all belong to the Capsicum chinense group, and they are very sensitive to soil calcium level. Their leaves start wrinkling when the plants have run out of calcium in the soil, like the gas gauge indicator in your car reading <empty>. The easy solution is to add calcium in the form of powdered limestone or wood ashes, until the wrinkled leaves of these calcium-indicating hot peppers flatten out. The indication from the first test plot in Haiti, is that many agricultural fields across the island may be so low in calcium, that agriculture in those calcium deficient fields could only continue for another 5-10 years at best. Dremann speculates that adequate calcium has not been added regularly to the fields in Haiti for the last 200 years of agriculture, to replace the calcium being removed each year by the crop harvests, perhaps because there was no easy way to measure low calcium levels in soils. Now, this new calcium-indicating method using hot pepper plants, can cheaply and easily check calcium levels and correct for deficiencies that are found. The paradox in Haiti is a country with calcium-rich limestone deposits, so by utilizing powdered limestone from local sources, the low calcium problems in the fields should be an easy fix. The plan is to plant a couple of dozen of these hot pepper plants evenly spaced in each agricultural field. 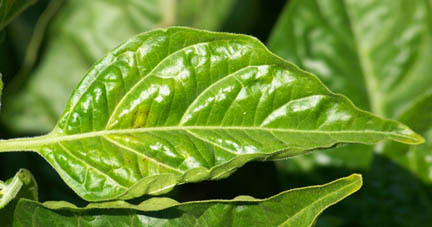 Then check for wrinkled leaves as the pepper plants grow, and fertilize the whole field if wrinkled leaves appear. Then continue to add calcium every few weeks until the wrinkles in the pepper leaves flatten out. Dremann estimates that just by adding an adequate amount of calcium to the fields of Haiti, crop yields could increase 250-300% over the current yields in the depauperate soils that have not been fertilized with any calcium for decades to centuries. Using pepper plants of the Capsicum chinense group as soil calcium indicators, could be used in any subtropical to tropical country in the world. An additional benefit for the farmers, is that the fresh or dried fruit crops from this group of peppers are the hottest in the world, so usually command the highest prices in the markets. Pepper plant showing the calcium starvation in the soil, as wrinkles in the leaf.. 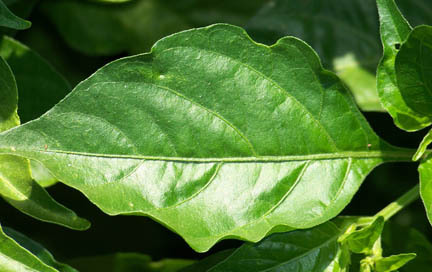 The normal pepper leaf is nearly flat, showing adequate calcium in the soil. Contact: Craig C. Dremann - Release July 30, 2012 Redwood City Seed Company and Crystal Clear Rivers (SM) and Haiti Agriculture Innovations (SM) project, Box 361, Redwood City, CA 94064 (650) 325-7333. Project Manager, Ed Thomas in Orlando, Florida. (407) 459-3771.
http://www.ecoseeds.com/clear.html - Updated January 16, 2013.